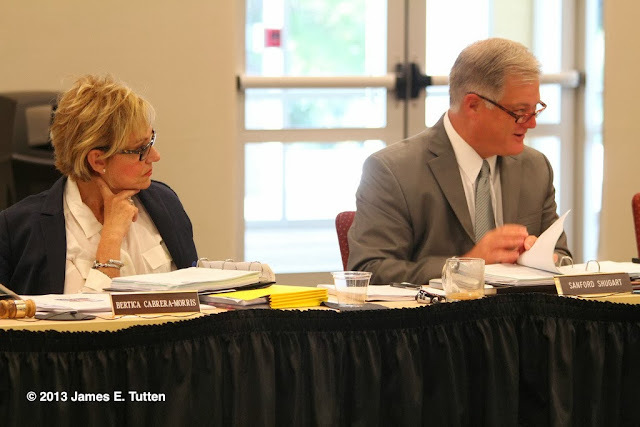 ORLANDO — The final board of trustees meeting at Valencia College for the spring semester also witnessed the bittersweet goodbye from Valencia trustee chairwoman Bertica Cabrera-Morris after seven years on the board. There were published accounts of public disagreements between Morris and Shugart over the direction of the college’s financial path in recent weeks and tension was starting to become noticeable between the two. Morris insists that she will not contest the decision leading her to departure from the board of trustees and she intends to still work on the issue she considers important by lobbying against them. This decision from state lawmakers came the day before this meeting on Tuesday, April 16, and was addressed by Morris at the start of the regularly scheduled board meeting. She raised up in her right hand a copy of the Orlando Sentinel with the article published about her, but made clear that she wanted to focus on the business issues of the college and not on the controversy. The meeting then went straight into the issues at hand with the first major topic being the ongoing marketing campaign to Hispanic students. “Last year Valencia invented 1.7 percent of its total broadcast TV budget on Spanish language television, 14 percent of its radio budget on Spanish language radio,” said Ulysses Arrigitia, a senior vice president of integrated marketing solutions at Univision, Unimas, and Salsa 98.1 FM. “According to Kantar Media Valencia spent $278,000 on TV ads in 2012 and only $5,000 was invented on broadcast Spanish language television. With the rise in the Hispanic population in the Central Florida over recent years there was much discussion on increasing the marketing to Spanish language broadcasts to appeal to the culture to Spanish-speaking students and their parents. Before a final decision is made on the advertising budget another board member, Lewis Oliver, requested further details about the effectiveness of this outreach to Spanish broadcasts because of the inherent lack of exposure to non-Spanish speaking students. Other topics discussed at this board meeting included the changes in the overall budget for the college with a notable $9 million drop in construction cost from last year to this year due to the finished expansion of Osceola’s Building 4, West Campus Building 10, and the new Lake Nona Campus. Despite the expansion and new campus added the cost of electrical expense has stayed nearly the same due to energy efficient materials and other power saving measures. Several times throughout this board meeting Valencia administrators made a point to thank chairwoman Morris for her service to the college. This was meet by gratitude from the recently ousted board member who replied with a simple “thank you” as she diligently held back from the emotions of saying goodbye.